Yes, coffeehouses are known for their coffee creations. We don’t dispute that. However…. When in business serving beans, you have to remember that upsells and branding are big! You can’t just sell the coffee alone. Sell the coffee containers. The cookies. The sandwiches. The everything! Why do you think Starbucks is just a big name? It’s not just because of their beans, but the ambiance of walking into one of their shops and ordering a cappucino. That’s why — yes, we’ll explain this big time — custom coasters can be a massive hit for a lot of reasons. For One Thing, Yes, the One-Timers in Line on Their Way to Work Make for a Good Portion of the Revenue…. But what you really want are the ones who stay for a much longer time. Those customers end up buying more. Which means more money for you and your business. In order to get them to stay, though, you need a bit of design and marketing for a coffeehouse that not only looks inviting, but functional. Custom coasters with your name on them represent home. Think about it. You have the couches, and the coffee tables everywhere. 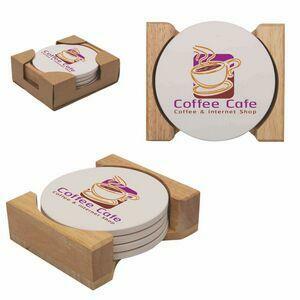 Custom coasters neatly placed on an end table as well make for that inviting “sit for a while and enjoy your coffee” mentality. Let them put their feet up. And bonus points for you if you happen to have a flat screen TV (although honestly it’s not necessary). The great thing about these custom coasters you can purchase and personalize right at BRAVA Marketing is that they’ll last nearly a lifetime, most likely. It’s not like you have to keep restocking! Get them. Strategically place them. Get the brand out there. Because you know the longer customers stick around, the more they’re going to remember your coffee and your brand. And After They Get Their Coffees Off Your Custom Coasters and Head Out…. They’ll remember to come back for more. Businesspersons. Artists. Writers. Or just stay-at-home moms wanting to chill with friends over an awesome mocha. That’s how coffeehouses flourish. So contact us right now! Make it a skinny.